olive and ollie: Sew Mama Sew Giveaway Day! Better late than never, right?! I'm so excited to be participating in Sew Mama Sew's Giveaway Day this year and I've got an awesome prize for you and one of your friends. I'm giving away a three-month subscription to Creativebug! One winner will receive a subscription, and in the spirit of the season, the winner will also receive a three month subscription to give away to a friend. It's a gift for you and for one of your friends! If you're not familiar with Creativebug, you really should be. Creativebug is an online community of craft classes and video workshops with some amazing teachers, including Amy Butler, Anna Maria Horner, Kaffe Fasset, Liesl Gibson, and more. I seriously love Creativebug for many reasons, and one of which is that as a subscriber, you have access to all of their workshops. You can also purchase classes a la carte if you prefer, but it's such a great deal to buy a subscription. And besides having such wonderful content, the workshops are so beautifully filmed which really appeals to me as a visual person. and my Mod Stripes quilt class. All of my classes are geared towards beginner quilters, or those of you who are looking for modern quilt patterns that are easy to construct and have strong graphic impact. You can read more about my time on set here, if you'd like. To enter, please leave a comment below. Be sure to leave your email address so I can contact you if you're the winner. The giveaway is open to everyone, both in the US as well as our international friends, and it closes on December 13, 2014 at 5:00 PT when I'll use the random number generator to pick a winner. 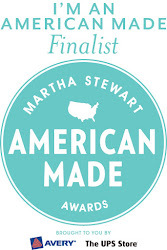 Good luck, and be sure to check out all of the great giveaways on Sew Mama Sew! I am always, always learning, and buddy, there's so much more I need to know. I would LOVE to win this subscription. Thank you! What an awesome prize, plus my friend, Julianne, would win too? Whohoo! Thanks for the chance! Sounds like a fantastic chance to improve my skills!, and there's so much new to know! Thank you! It is so crazy seeing your diamonds in the sky quilt because you were working on it the first time we met! Can't wait to watch the video! Your workshops look so amazing!!!! I'd love to do a workshop. I'm limped through making a few quilts, but could really use a good teacher. Fantastic giveaway. I had not heard of creative bug before. What a great giveaway!! Thanks so much for this- been wanting to try it out! I've never used Creativebug, but the classes sound exciting! Thanks for the giveaway! Looks so fun, Heather! Thanks and happy holidays! I've never heard of Creative Bug, but I love learning! Learning with a friend is even better.Thanks for the giveaway! 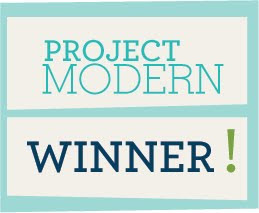 what a fantastic giveaway -- thanks for the chance to win! I love online classes. I would love to win this. Fingers crossed. Love those quilts….the classes look like fun! Gah! That rainbow quilt is just gorgeous! Wow, what a giveaway! I know just who I will gift the subscription to. Exciting. Great colors! I mean, obviously, since it's a rainbow quilt. But great colors! I love bold and bright...beautiful colors! I'm going to check out Creative Bug right away! I love learning about new blogs...thank you! I've never heard of creative bug, but now I will have to check it out. It sounds fabulous! WHat an awesome idea for a giveaway! Thanks for the chance to win! I'd love this. Thanks for the chance! Great giveaway! Fingers are crossed! oh how cool! i just found out about creative bug and have been wanting to take a class, this would be great!! LOVE these classes. I want to take them ALL! I found out about it at Sewing Summit last year. Learning something new is always so much fun. Sounds like fun to me! Thanks for offering! That really is an awesome prize! Thanks so much for the chance to win. Love SMS giveaway, it opens up a whole new world of blogs. Hello, Heather! I have a school break starting tomorrow and I can't think of anything better than watching some Creativebug videos as I get some holiday stitching done. I would share with Loretta. The rainbow quilt looks awesome. Thanks! Lovely quilts and I enjoy your blog! What a great prize. Thanks for the opportunity. Ohhh its lovely! Thanks for the chance! I think this would be awesome to win, Heather. I love that you're doing it with a friend. I would choose my mom because we don't live in the same state (500 miles away) and when we see each other there's always some crazy event (like a holiday) so it's hard to get sewing done ... I have the diamonds in the sky quilt and will have to dig it out. Thanks! I already know what fabric I'd use for the Diamonds in the sky quilt! Thanks for the giveaway! i love your quilts. What an awesome prize. I was just saying I wanted to take some classes this year! I'd never heard of Creativebug til now. How fun! I've never heard of creative bug before. What a great gift. Thanks so much for the opportunity. Thanks for to chance to win! I love online classes! Online classes are my new favorite thing! 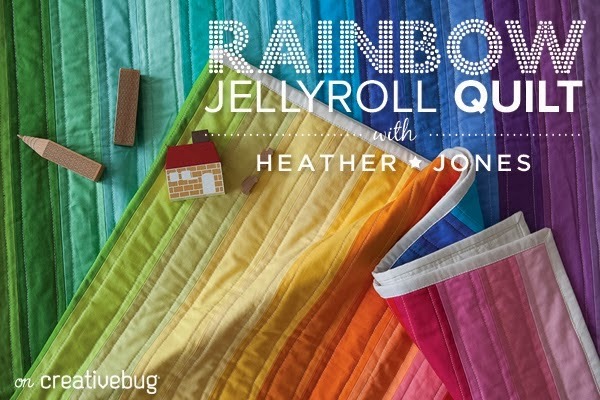 Love the rainbow jelly roll quilt! That's a great opportunity to learn more, thanks for the chance! Well how fun is this!? Love online learning! How wonderful... thank you so much this chance! I Love to learn. Lately most of my quilting has incorporated rainbow colors so this is perfect! i just checked out creative bug for Amy Butler's classes - nice to have options out there to learn & love to take classes! and interestingly enough, i just made 2 color graded jelly roll quilts with Kona darks and Kona dusties for the twins in our guest room - love them! Creative Bug has a great set of teachers. Would love to try some classes. What a great giveaway! I am definitely a beginner and would love to learn!!! Thanks for the chance to win! I hadn't heard of creativebug before! What a great giveaway! It's nice to be able to take a class when you want in the comfort of your own home. I am newly learning quilting. I have always made clothing. I am loving quilting, even though I am not so good at it yet! I just love giveaway day! thanks so much for participating. I've seen you mention it, but haven't investigated yet--this would be a great opportunity to try it out. Thank you for this giveaway! so cool would love to make any or all of those!!! I am a beginning quilter so this would be a wonderful prize. ooh, I will have to check out creative bug, it sounds awesome! I haven't tried CreativeBug yet - it sounds great! What a fun giveaway! I would love to watch those classes! This sounds like a great give-away. Thanks. I need all the help and ideas that I can get! What a great give away! I have quilted for over 30 years, but am FOREVER a student. There is always room to learn, for sure. Oh yes - I could do with some tuition!!! Would love to participate in your workshops! Thank you for the giveaway. I am so glad to learn about creative bug.com. I've been sewing since I was 5 and quilting only 20 years and I would love to learn more under your talented hands. Thank you! That's so cool. I've never been on CreativeBug. I think I'd never leave! Thanks for the chance. amazing giveaway!!! Thank you for the opportunity! Oh my, this is a great giveaway. I'm keeping my fingers crossed for this one! I love your rainbow quilt. I need to check out Creative Bug. Love Jelly Rolls. Thanks for doing the givaway! I like the rainbow jelly roll quilt; so colorful. I love the opportunity to win this subscription. I am a beginner and could benefit from the videos. I would love to learn how to quilt. Your workshops look great. I hope I win. Thanks for the chance. I would love to try this out. Finally, a contest for international readers!! I haven't tried the service, but I'd love to! LOVE your blog. Great ideas! It would be great to see some new ideas and not just read about it. What an awesome giveaway!!! Very cool. this is so great! right up my alley thanks! What a fun prize! If I win ill definitely have to do the diamond quilt! I really like that rainbow jellyroll quilt. I hadn't heard of Creativebug so I'm glad I stopped by. The rainbow quilt is gorgeous! I have never heard of Creativebug before. Will be checking it out. Thanks for the chance to win. hello from Massachusetts. Great giveaway thanks for the chance to win! The mod stripes class looks interesting. Your rainbow quilt is so inspirational! Sounds like a perfect plan for the holidays: watching a lot of instruction videos! Thanks for the great give away. I really like taking classes online. Have a great Christmas. I haven't heard of them before either. Thanks for the chance! This is the first I've heard of these classes - thanks for sharing! I'm so excited to learn about Creativebug; it sounds great! And I love your rainbow quilt! Love the rainbow quilt. Thanks for the giveaway. I hadn't heard about Creativebug. Thanks for the introduction. I'm so excited about this giveaway and to have found this blog! Thanks! Wow that is so fun. I have looked at that a few times, but just haven't taken the leap. Thanks for the chance to win. I'd love to win this awesome prize. Thanks for the chance to win. I hadn't heard of this site before but I'd love to check it out! I love to learn new things and your classes look good. Thank you for the chance to win. I am a new quilter so some classes would be wonderful. I have taken a few classes and really like the way the videos are filmed, the backgrounds close-ups and everything. I've been meaning to start quilting for a while but as I've never done it before I didn't know where to start! Love your quilts by the way! Fantastic prize! I am excited to learn more about a (new to me) craft! Thanks so much! Would love to win! What a cool prize! I would love to learn more! You have a real eye for colour! I would love to learn some new techniques! I'm all self taught so who knows if I do it right! What an awesome giveaway! I love you quilts and would love to take a class with you. Really lovely giveaway! Thank you. Great giveaway. I didn't know about it. I have never heard of Creativebug but it sounds amazing! I'm definitely going to check this site out! Thanks! What a wonderful prize. Thank you for participating in the Giveaway Day. I would love to learn something new! I had never heard of Creativebug. But I will check them out. What a wonderful prize to giveaway. thank you. This is the first I've heard of Creativebug. I'll be sure to check it out. Thanks!